Now, I started this post on a lazy Sunday morning (July 20). It was 66 F outside with a projected high of 85 F. Mind you, this is Texas in the middle of July!!!! Normally, by now we are cranking out high 90s and 100+ F temperatures daily. It stays this way through mid-September when it rolls back into the low 90s to mid-80s F. Two days before, however, we had broken the record for low temperature in July with a morning temperature of 65 F. 65 F is simply unheard of in Texas in late July. The high that day was 77 F. We had gotten much needed rain, a little respite from the drought that has plagued the State for 3 years and 3 beautiful days. It has simply been one of those summers we desperately needed. Today, it’s August 5, 2014, and we have only had 5 days over 100 F for the year. That is amazing! Typically, by now we would have at least 10 – 12 days of 100 F or more. The average number of days of 100 F or more for the year is 19 days with the bulk of those days coming in July and August when the heat simply saps all of your energy and the electric bills are sky high. Because Dallas has so many lakes surrounding it, it has relatively high humidity for being so far inland. As a result, it’s not unusual during August to look at the temperature at 9:30 pm and see it’s still anywhere from 95 F and 100 F depending upon how hot it was earlier in the day. When it gets this hot, grilling outdoors simply isn’t any fun. 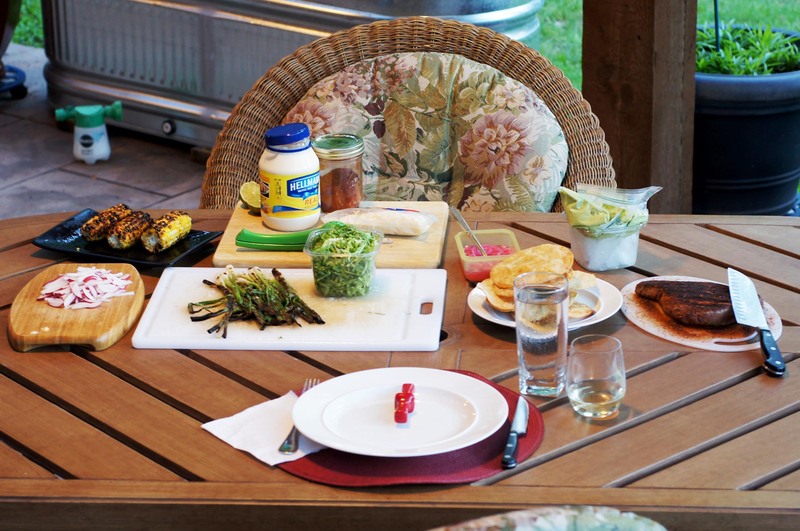 So, when you get beautiful days when you can grill and dine outside, we try to take advantage of it. This post was one of those days – a lovely, cool, summer day on July 19 (yes, it has taken me this long to get time to complete this post – heavy sigh). It was a beautiful day as we had experienced some early morning showers. Not a lot of rain, mind you. Just enough to water the lawn and garden, keep the temperatures at bay and leave large, white, fluffy clouds in the blue sky as the day progressed. Pretty nice day. On days like these I get the urge to grill and eat on the patio. So, off to the market I went to see what I could find. They had some beautiful, fresh Ahi tuna, some very nice, ripe Hass avocados, and some nice green onions. 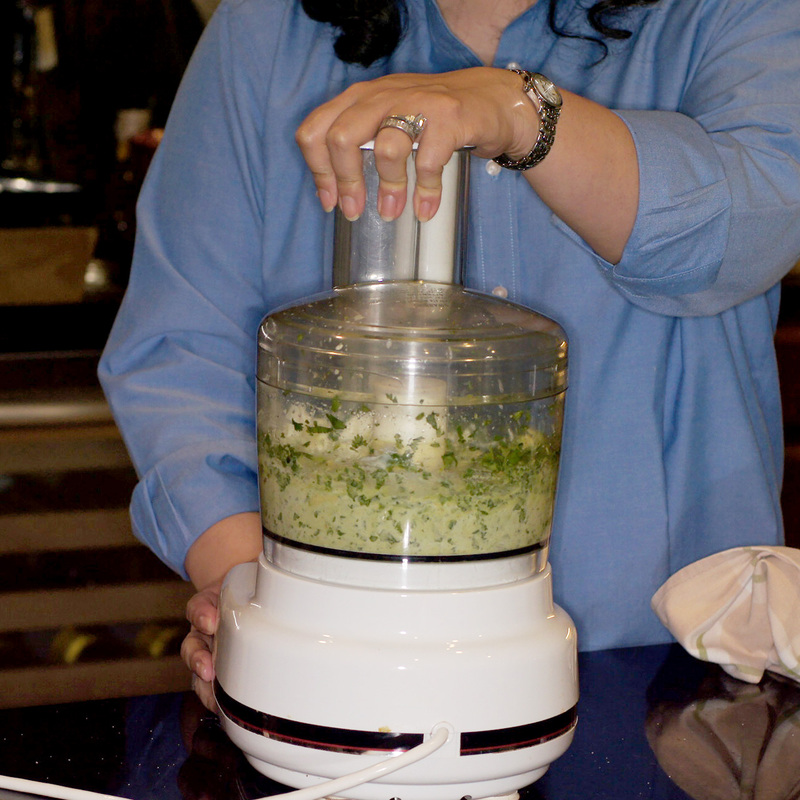 Now, Baby Lady makes a fabulous avocado cream that goes beautifully with grilled fish. Everybody who has ever tried it has loved it. 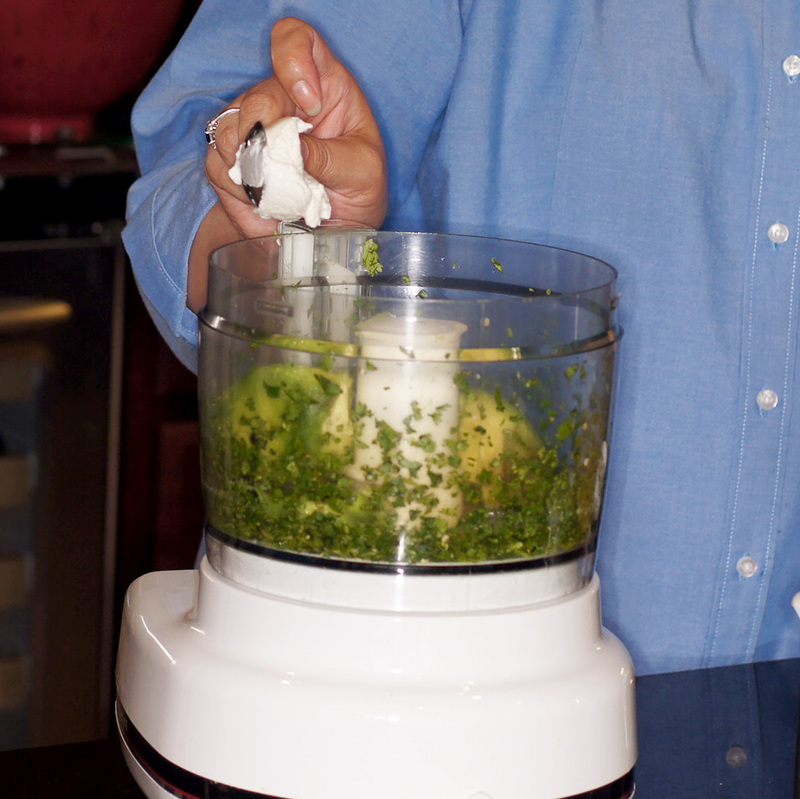 Some have even gone so far as saying they like it better than guacamole, especially for topping. So, seeing the beautiful avocados and tuna a plan began to form in my head and this is what we did. 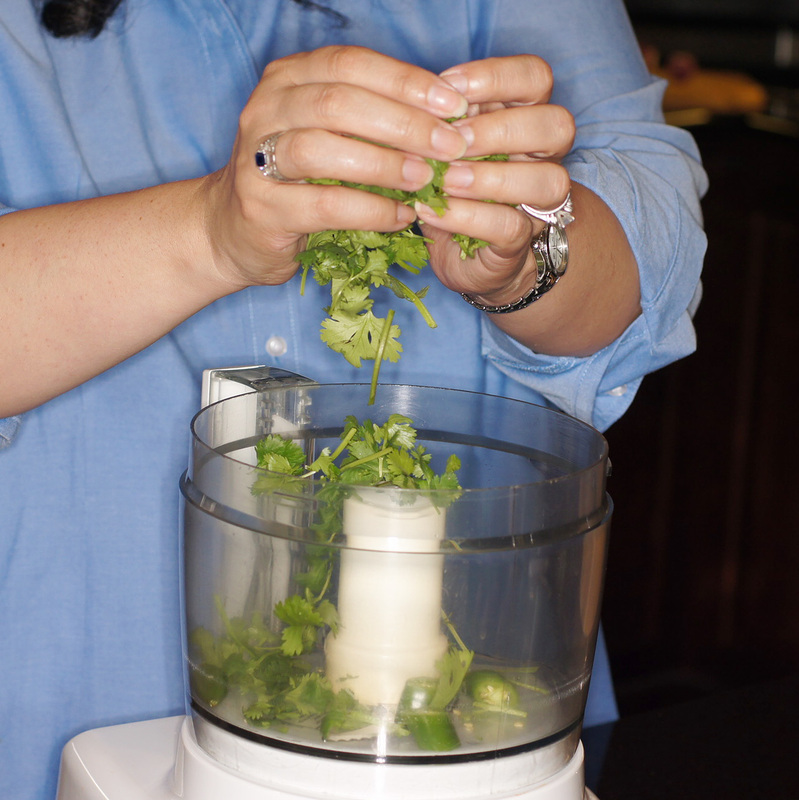 Rough chop the Serrano chile and place in the food processor. 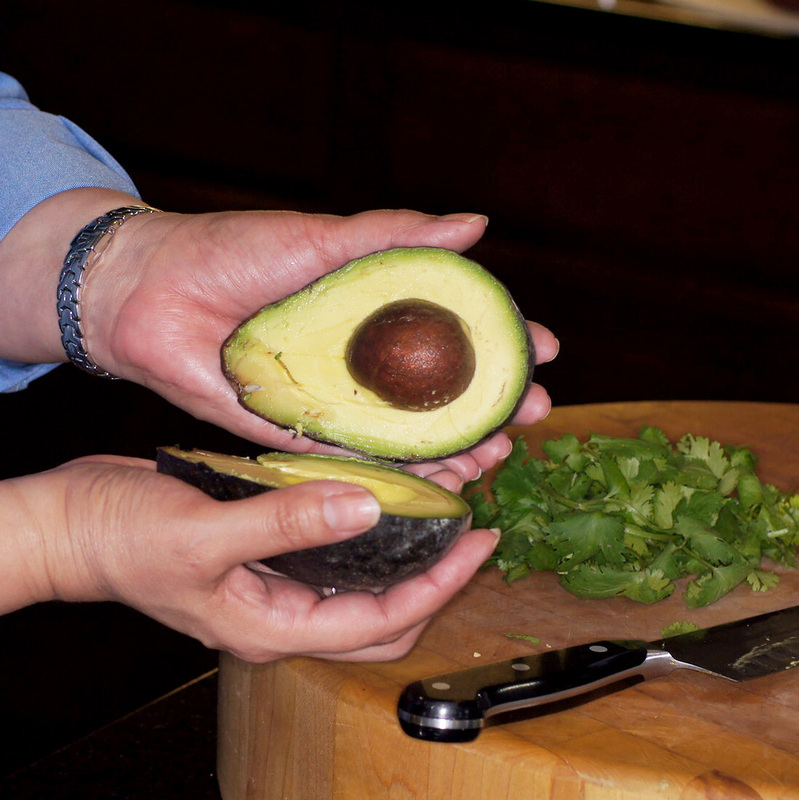 Slice the avocado – look how beautiful this avocado was, perfectly ripened. 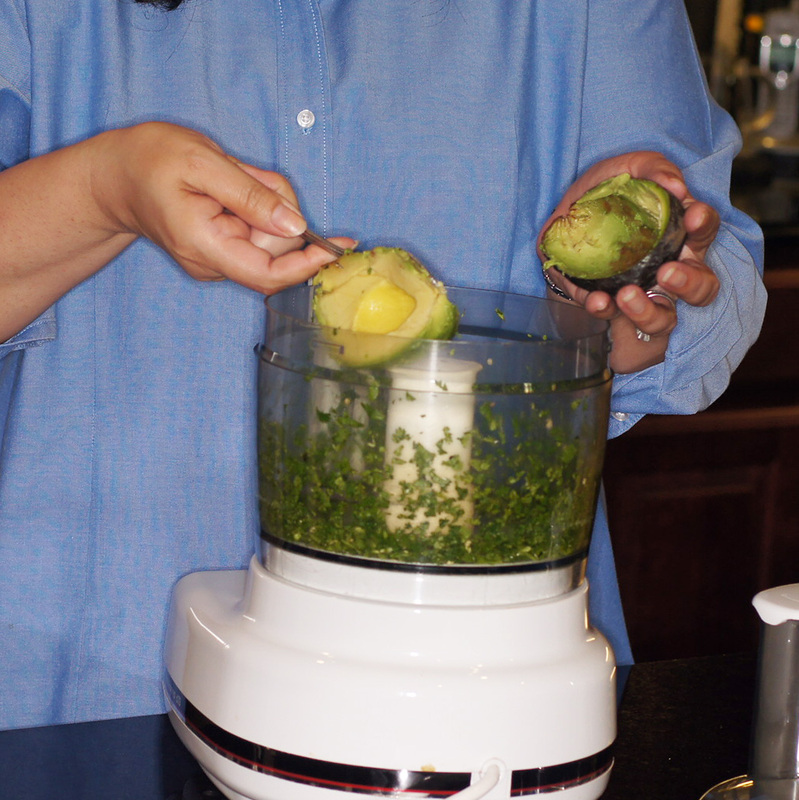 Scoop out the avocado flesh and add to the food processor. Now, add the sour cream. finish with a touch of salt, to taste. 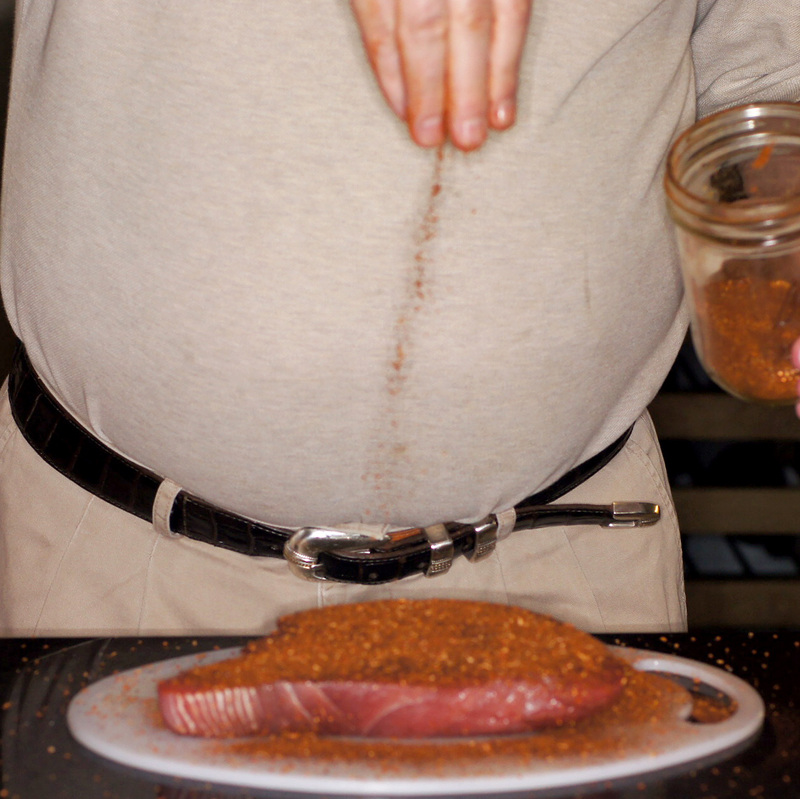 Adjust seasoning to your taste. Baby Lady actually got this a little hot and added another tablespoon of sour cream and a touch more salt on this batch. 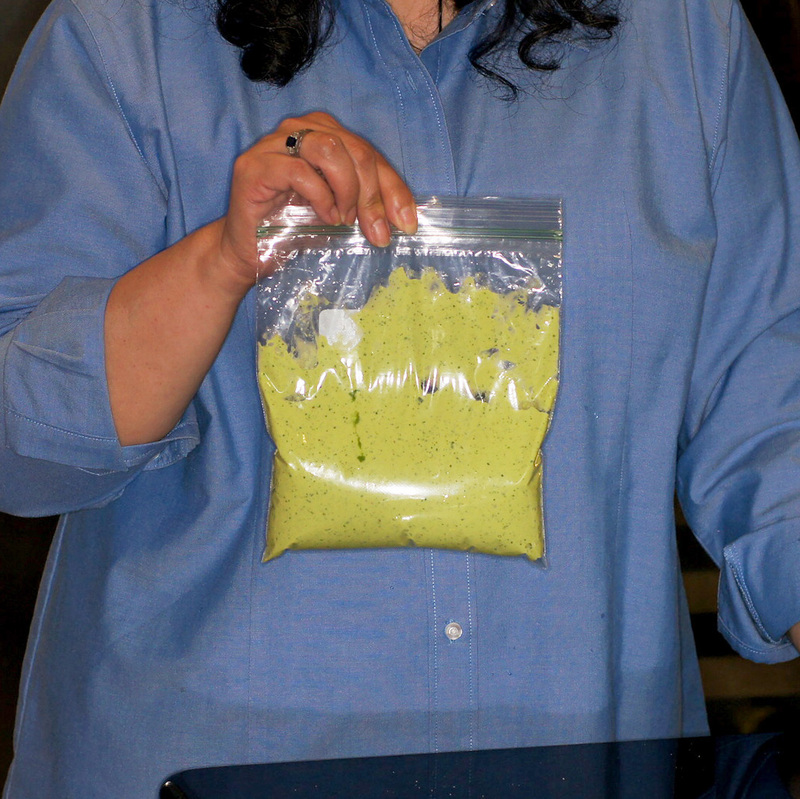 Place in a zip lock bag and refrigerate until ready to use. 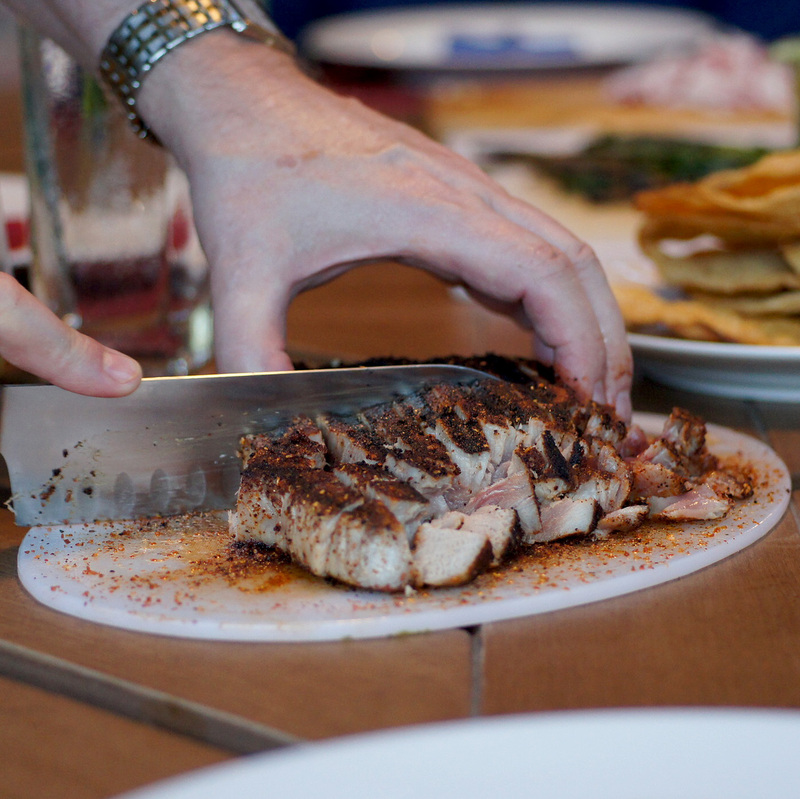 Season the tuna with some ancho chile rub. Place tuna over high heat and sear. 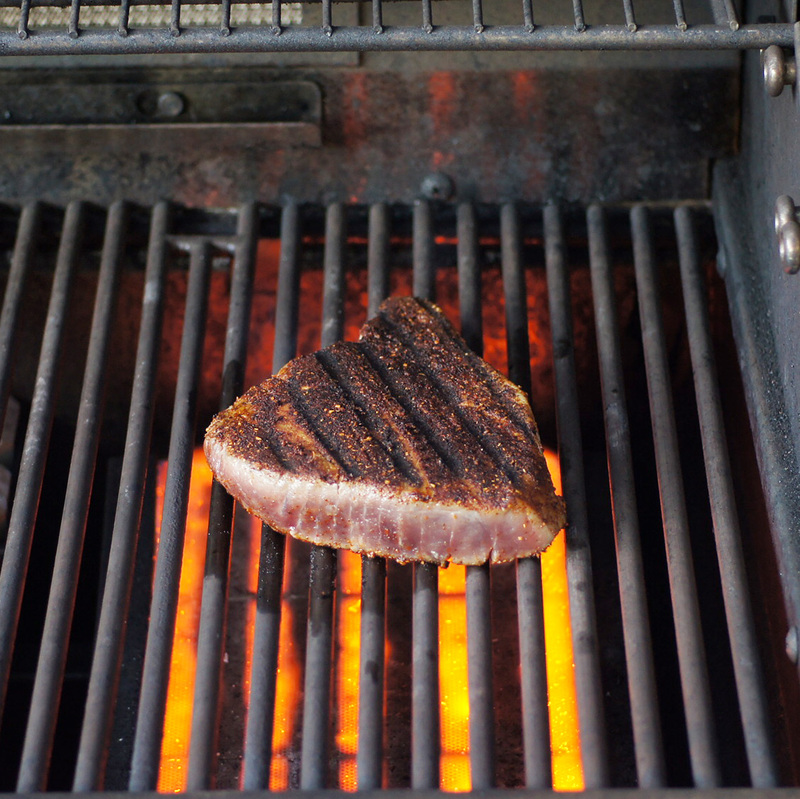 Remove tuna from grill and allow to rest for a few minutes. Then cut tuna into chunks. 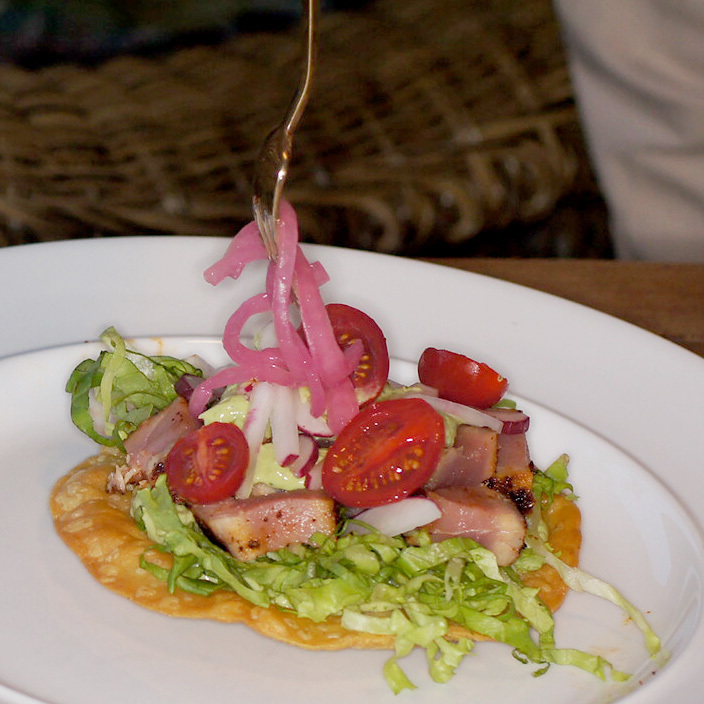 Place a tostada on a plate. 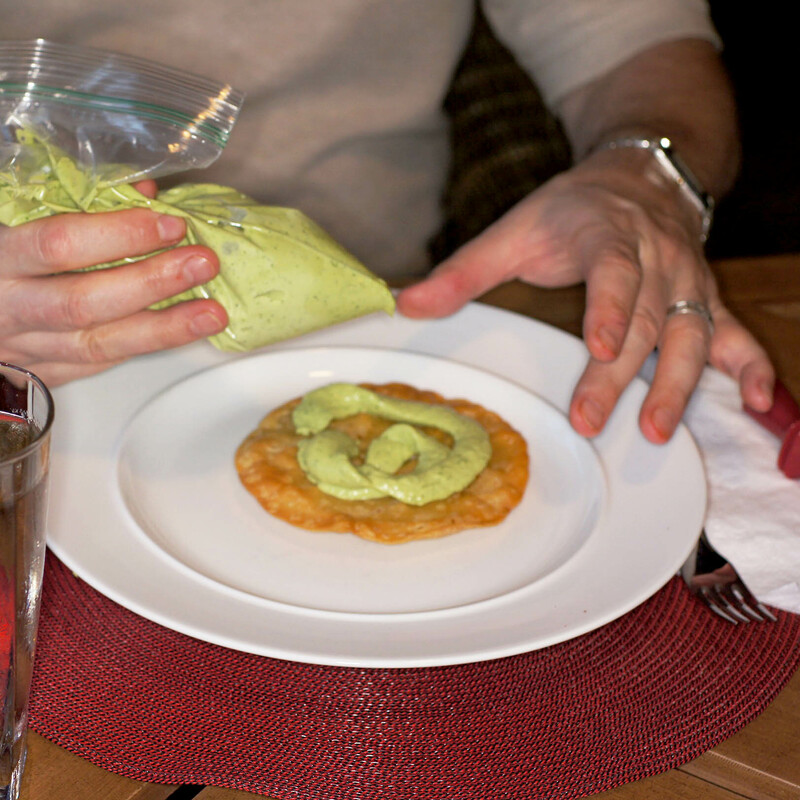 Snip a corner of the baggie and, using it as a pastry bag, add a little of the avocado cream to the bottom of the tostada. 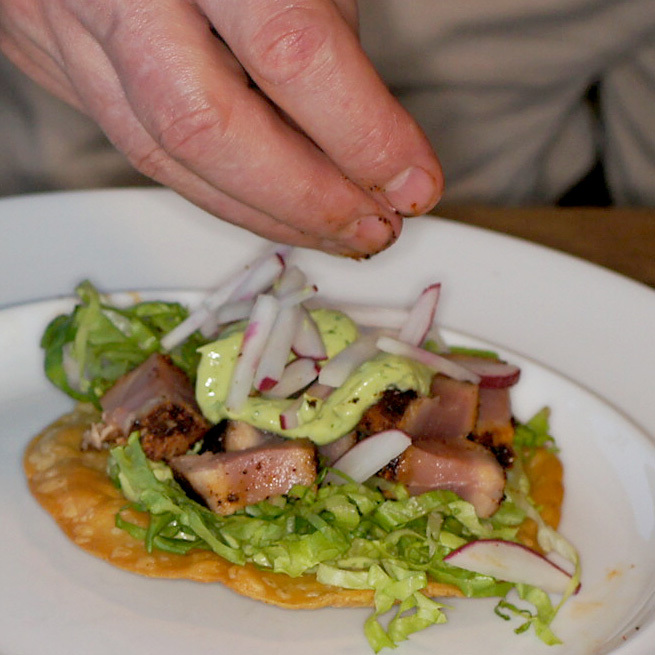 This helps everything stay somewhat in place on the tostada as you eat it. 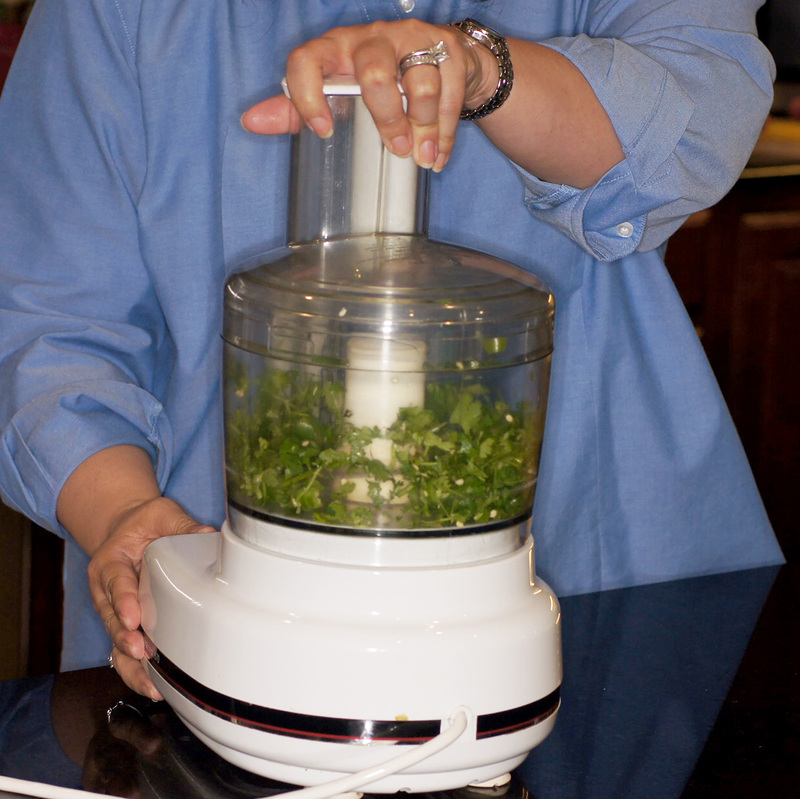 Now, add a little shredded lettuce. A little more avocado cream, just because it’s soooooo good! 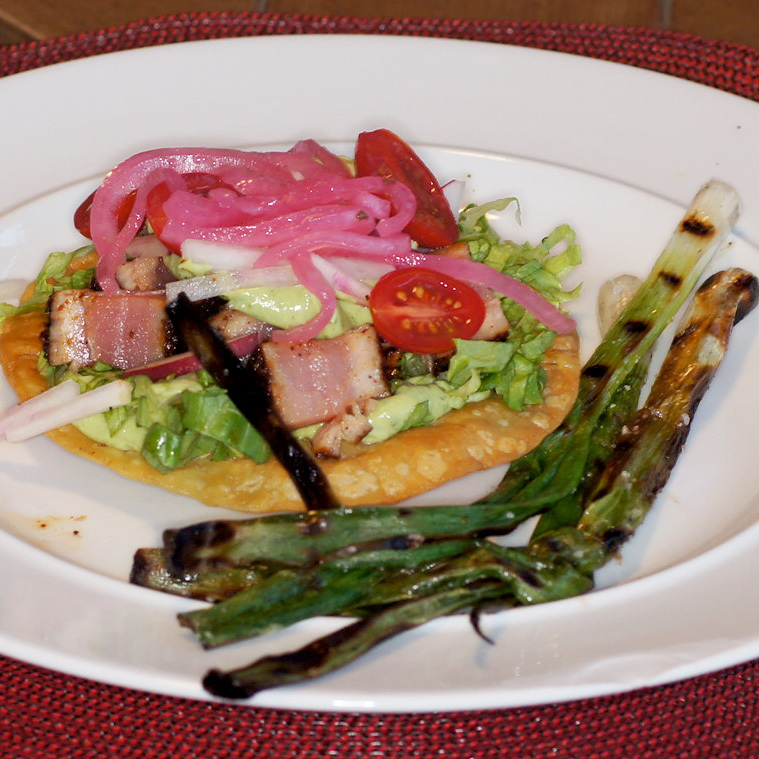 Finish with some lime pickled red onions. Serve with some freshly grilled green onions and a little crazy corn on the side – Enjoy! Beautifully done Richard. Two things on the tuna. First, the ancho rub looks fantastic on the grill. Secondly, you cooked it to perfection. Great summer post, even if you are being denied your Texas summer. Very nice Richard, perfect for the summer! Over my last trip to both Miami Beach and of course the Baby Lady and yourself, I really discovered the joys of stuffed tortillas (corn and what, soft or crispy – I don’t care if they are called tacos, fajitas, burritos or whatever ;-)) with the freshest fillings. I can only do so many posts on them before getting repetitive, but I’ve been preparing this type of stuff more often. The avocado cream sounds very nice and I like the idea of using it as ‘glue’. Also, I’ve almost run out of the batch of ancho chile rub I made myself after finishing the batch you sent over, so soon I’ll be making another batch. Everyone loves it; I especially love it on tuna. Everything about this dish is fabulous!!! Love the tuna, love the avocado cream… Funny, when it was so cool in TX and OK, we were in London and it was 85 degrees!!! I was sorry to miss out on the decent weather, but at least fall is coming… Hope all is well! Texas in summer sounds like Melbourne, best avoided if you can! 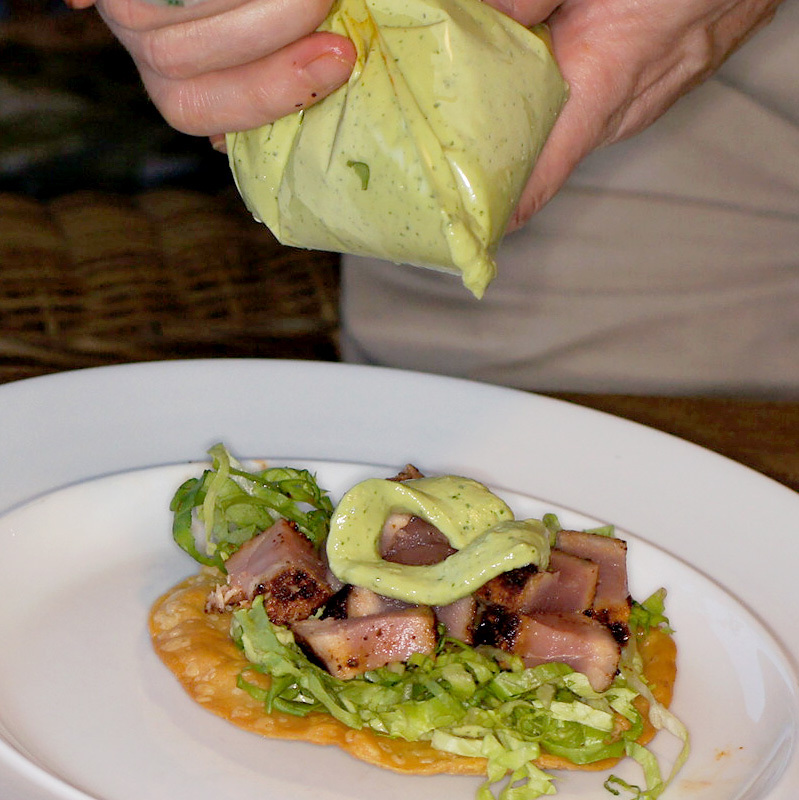 Like the sound of that avocado cream…. 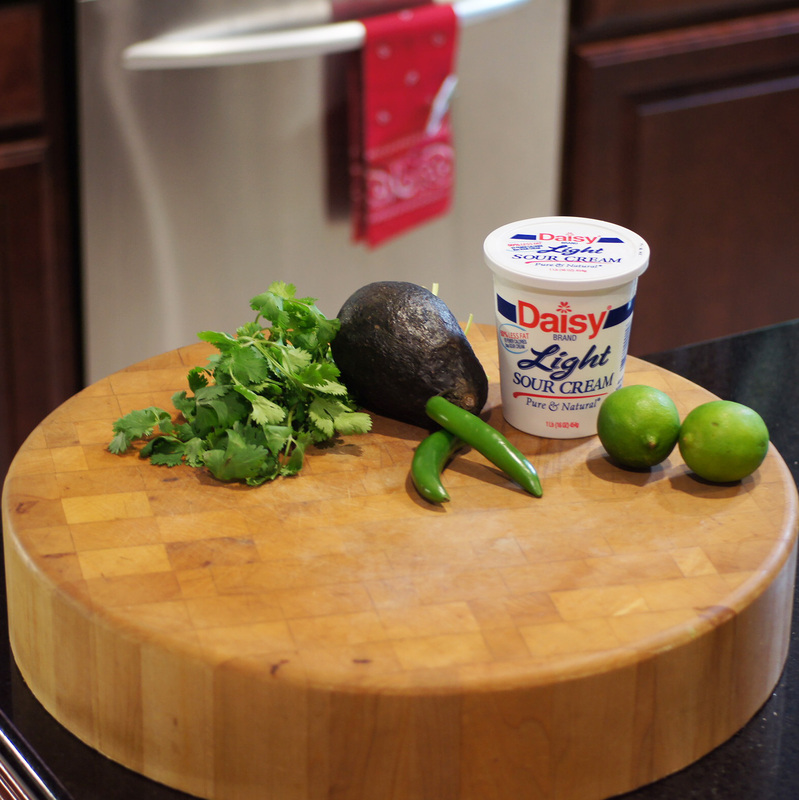 I love avocado cream too, my recipe has a little coconut milk rather than the sour cream. It freezes very well (I usually scoop left over cream into a dedicated ice cube tray and freeze, put frozen cubes into a zip lock bag for future use). 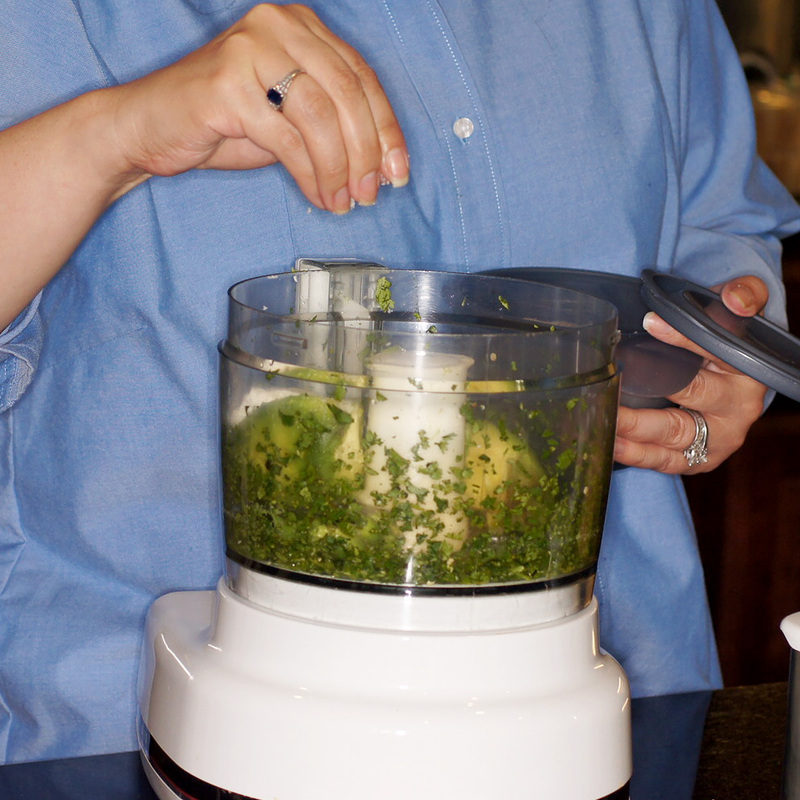 I’ve never eaten avocado cream – I want to some! Great post!! And I’m glad you’ve had an unusually cool summer – up here in Massachusetts – it’s been hot… at least for us ! But the nights recently have been really cool, which is great for hanging around a fire pit. 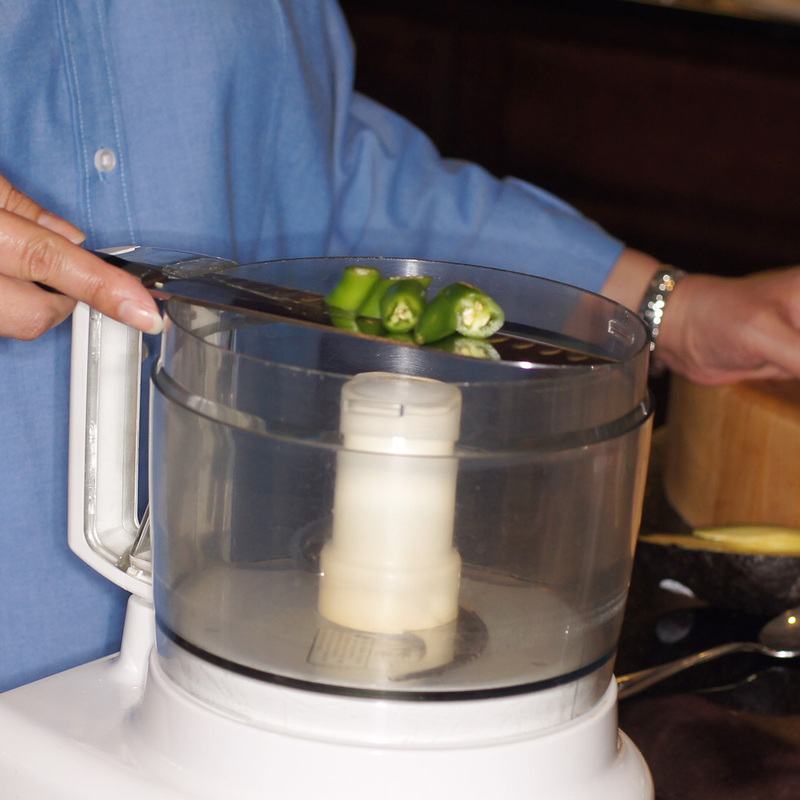 Just like grilling – no one wants to hang around a hot fire when it’s hot, hot, hot outside !! Wonderful chalupas Richard! 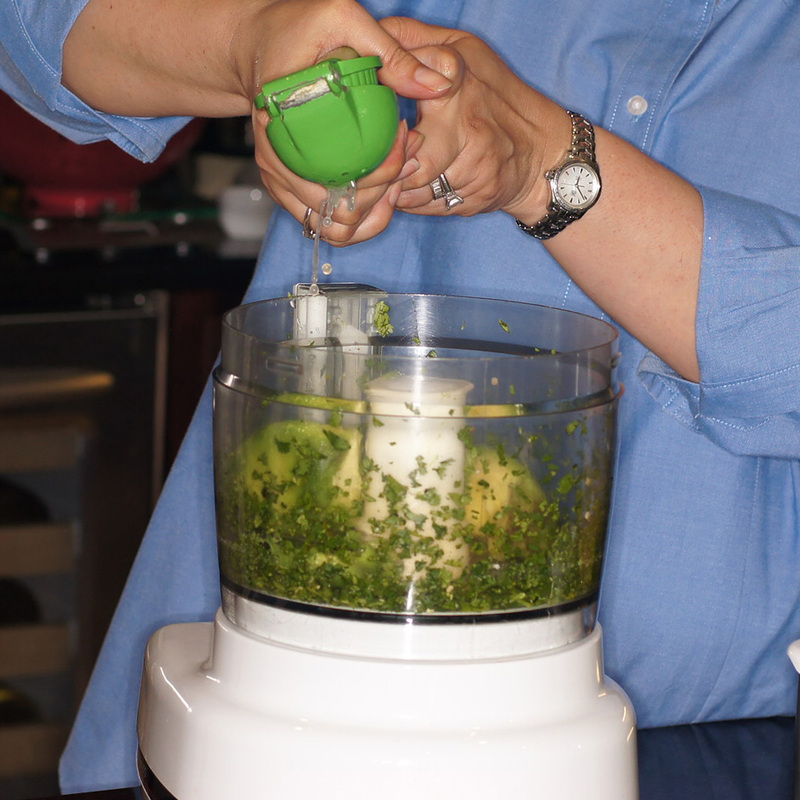 I will have to try my hand at that avocado cream. I have some beautiful serrano peppers I’m growing, and some are almost ready to be harvested. It’s funny, my parents come here to Oregon to spend the summers to escape the Texas heat, and it was almost 100 degrees here and 70ish in Texas during that time frame! We are back to more seasonal temps now. We had a pleasant dinner on the deck in 79 degree weather and 25% humidity. Ahhhh. Another wonderful recipe Richard! All these flavours coming together in a great dish! Love it!!! I have enjoyed reading this post. The weather here is also so cool it’s unbelievable, we haven’t had any real summer yet. The table table setting in the backyard is great, it seems so comfortable and inviting. 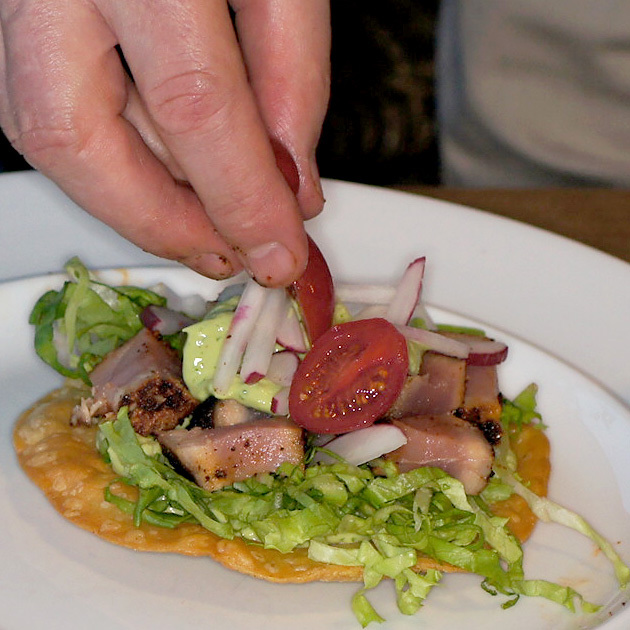 I love the way you assemble the grilled tuna, with avocado cream, radish and pickled onions. I would like to try that avocado cream. It must taste extra special Thanks so much for sharing and wish you a fabulous weekend! Being able to cook in our backyard again will definitely be a highlight of being back in NZ after Asian apartment living!!! Hope you guys are doing well and enjoying being back in NZ. Thanks for your comment.